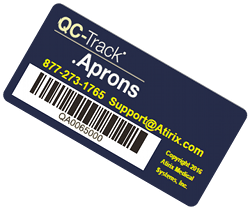 Two types of QC-Track®.ApronsTM tags are available, fabric adhesive 1” x 2” tags and plastic 1" x 2" tags. Both types of tags have a universal unique tracking ID and barcode. The adhesive tags have a 3M adhesive that forms a permanent bond with apron material. Each plastic tag comes with an attachment ring or clip. The tags are large enough to be visible, small enough to stay out of the way, and can be attached to any article of PPE, from aprons to thyroid collars to lap shields. The tags are also tough enough to withstand the day-to-day challenges that aprons experience, including folding and cleaning. Annual QC Indicator tags give you an easy, at-a-glance way to see if QC has been performed on an item. Atirix will customize the Annual QC Indicator tags with a year indicator and a unique color. Scanning the barcode tag saves time and reduces data error entries. You can scan tags from any QC-Track capable workstation, which means any workstation connected to your network and able to run a browser. Atirix Support can help with barcode scanner testing to confirm compatibility.